The last few days of medication changes for Jody went off without a hitch so he was able to be discharged yesterday (woo hoo!). One thing we found out since my last post is that when he was in the hospital last week he apparently tested positive for the Rhinovirus (the virus which causes the common cold). This could also explain the excessive fatigue he was experiencing. Most likely it was a combination of both this virus and the antibiotics which were not effectively fighting the bacterial infection in his lungs. In Jody’s case the Rhinovirus could take up to six weeks to go away, but the bacterial infection should start to improve. In fact, Jody’s PFT’s (lung function studies) yesterday showed an increase of five percent from a week ago (22% then, 27% now). Hopefully things will continue to move in the right direction. He does already seem to have a little more energy than last week so I’m thankful for that. Thank you for the anniversary well wishes. We were able to make the most of it despite our surroundings. It was nice to simply spend the day together (without the kiddos). Jody could have been transplanted and kept sedated on a ventilator in which case the day would have come and gone without any form of celebration whatsoever. We’ve decided that since this anniversary was especially low-key, we’ll just have to celebrate our 10th in a BIG way! 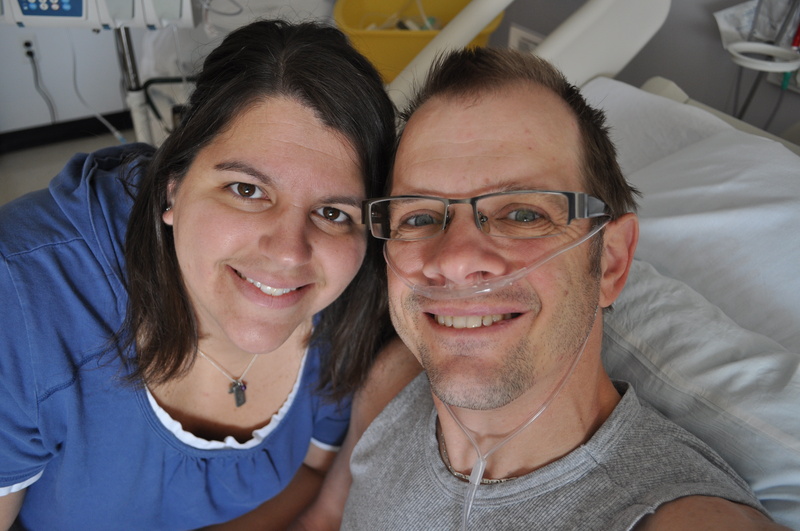 Celebrating 9 years of marriage, hospital style. So glad to hear that things are improving. All of you continue to be in my heart and on my mind. Your regular updates are wonderful and always bring back memories of my time spent with my dad at “hotel Hopkins”. Praying for lungs! I am constantly amazed at how strong you both are as you continue of this stressful journey. I am praying for you all.